One thing that tops many travelers bucket lists is a trip up to the Arctic for a chance at glimpsing the beautiful, mysterious Northern lights that dance across the night sky. If you are planning a trip to chase the Northern lights in Sweden, you likely have a lot of questions: How much will it cost? 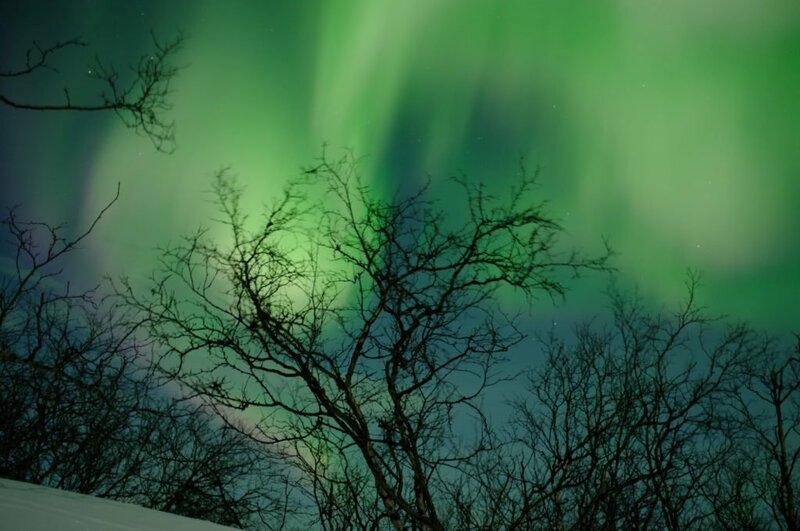 Do you need to do any tours to see the Northern lights? Where exactly should I go to have the best chance of seeing the lights? How long should I stay? And how the hell do I get the best photos of ti? 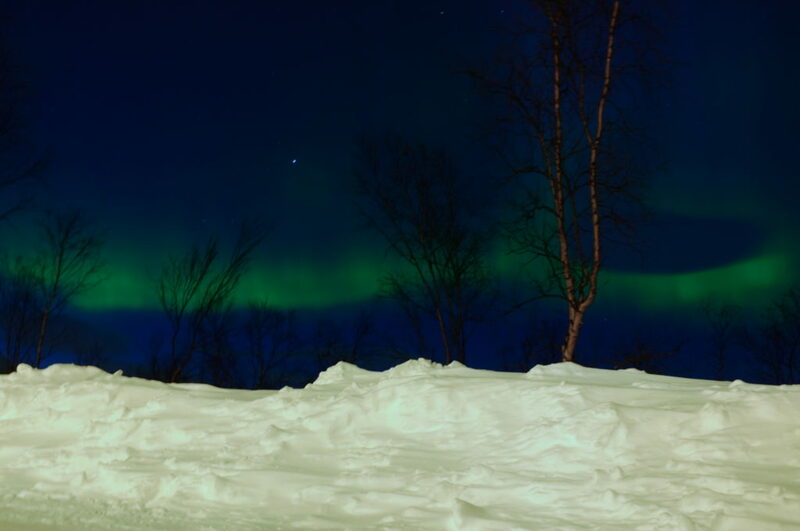 I’ve written this guide to help answer some of the questions I get about seeing the Northern lights in Sweden, mostly from people who have found this post about traveling to Swedish Lapland on a budget. Here’s some good news: Sweden is more affordable than its Nordic neighbors to the right and left, and luckily, it is one of the better places to see the Northern lights for a variety of reasons. Aaaand here’s some bad news: No matter what, the Northern lights are unpredictable, and while visiting Sweden on a budget is possible, it is still not cheap by any stretch of the imagination. 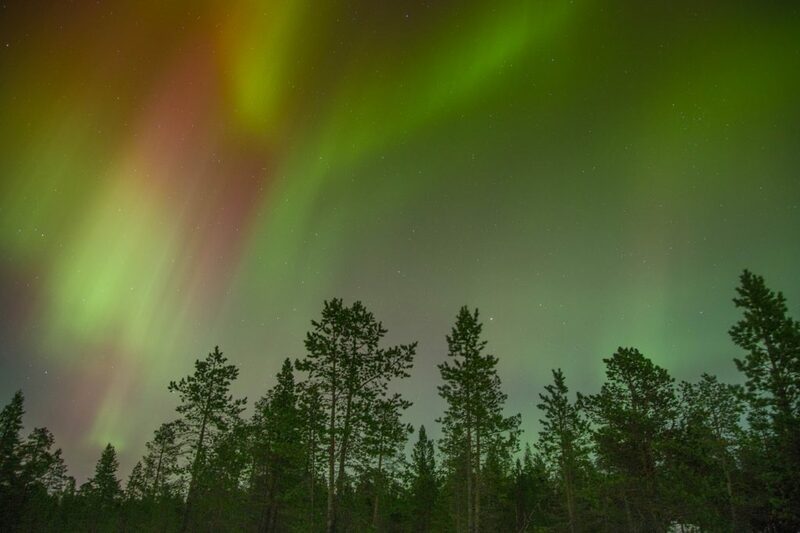 Hopefully, this guide will illuminate (ha) some of your questions and equip you with the knowledge you need to successfully plan a trip to see Sweden’s Northern lights. If you have any other questions, please drop me a message in the comments and I’ll answer within a few days! One big misconception about chasing the Northern lights in Sweden is that you can see them all over the country. Unfortunately, this is not so in most cases! If there is an extraordinary amount of solar activity and an especially clear night, you may be able to catch the occasional glimpse of the lights from the Swedish capital. I’ve actually met Swedes who have never seen the Northern lights in their own country! However, generally, Stockholm is too far south to reliably see the Northern lights. 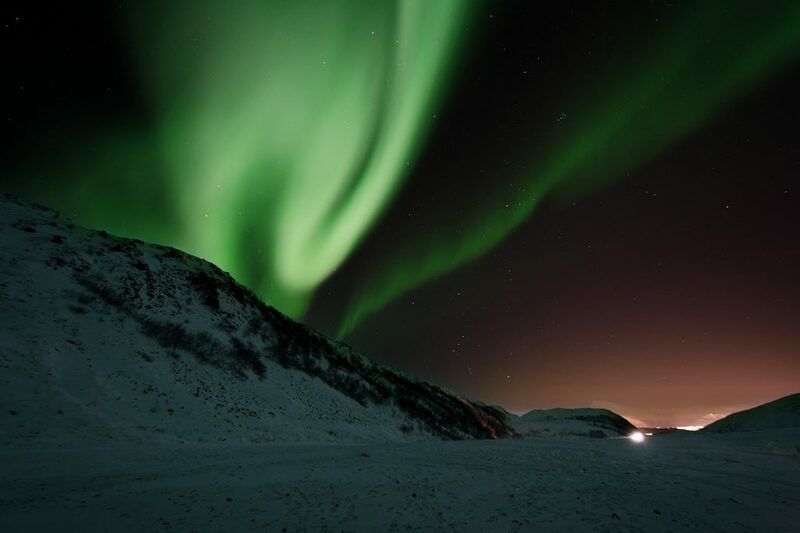 You’ll want to head north to the Arctic Circle in order to have the best possible chance of seeing the Northern lights. The regional hub of Northern Sweden is Kiruna, and there is both a train station and a small airport there. You can easily fly to Kiruna from Stockholm in 1.5 hours on Norwegian or SAS (I flew one way with Norwegian and the other way with SAS as each airline offered cheaper tickets on different days). Alternately, you can take the train from Stockholm to Kiruna or Abisko, which is a popular option but a little more expensive than flying… though to be honest, I think if you consider the cost of getting to and from the airport in all directions, the train works out to be a better – and more comfortable – deal. However, the train does take about 17 hours, leaving Stockholm at 6 PM and arriving in Abisko around 11 AM. So if you are super tight on time, or the thought of being on a train that long makes you antsy, you may prefer flying. There is a special microclimate in Abisko National Park as a result of Lake Torneträsk, which basically pushes cloud cover away from Abisko at night. In a major snow storm, this won’t be the case, but generally, Abisko enjoys relatively clear nights compared to elsewhere in Sweden and the Arctic. 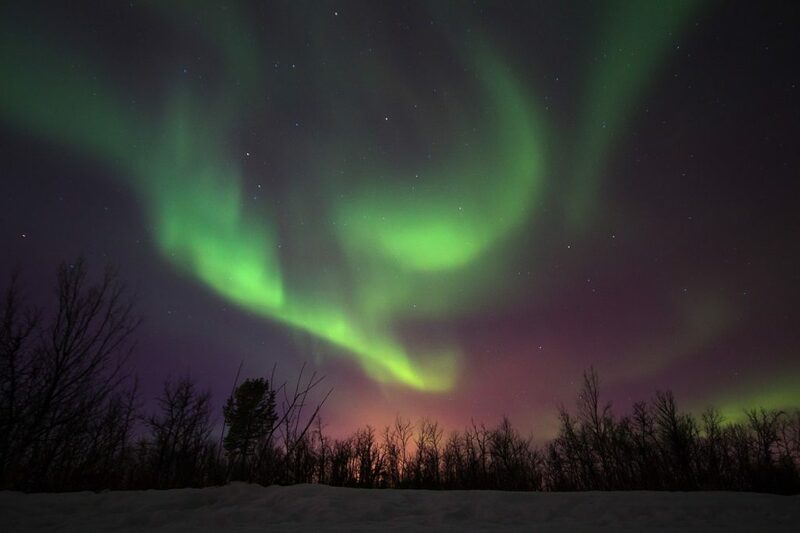 Scientists estimate that if you stay in Abisko for 3 days during aurora season, you have an 80% chance of seeing the Northern lights — those are some good odds! Also, the population Abisko is tiny – some 85 actual residents, plus a small but robust number of tourists staying in hotels and guesthouses. The perk of this is that there won’t be a lot of light pollution in Abisko. I was able to see the Northern lights just outside the door of my hostel at STF Turiststation, after giving my eyes just a few seconds to adjust to the dark. The great thing about staying at STF Turiststation is that it’s the only accommodation actually inside of Abisko National Park, so I was able to walk to the frozen-over Lake Torneträsk in about 10 minutes, giving me a great, unobstructed place to see and photograph the Northern lights. This sounds obvious, but it needs to be properly dark in order to see the Northern lights dancing overhead. And if you visit during the peak of summer, which runs from May to August, it is not going to get dark enough at night to see the lights. In fact, from May 25 to July 19, the sun doesn’t go down at all in Arctic Sweden (using Abisko as a reference point). However, even after the midnight sun ends, it still won’t get dark enough at night until around the end of August. Similarly, while the end of April will still be quite cold and there will be a lot of snow on the ground still, the days are getting longer — about 18 hours long at this point — which gives you precious few hours of actual dark night to see the lights. However, even if you go to Sweden during the aurora season, you are not guaranteed a Northern lights show. The aurora depends on solar activity. To get a bit geeky on you, here’s roughly how it works. Powerful storms on our sun’s surface send particles through our solar system – some of which make it our own pale blue dot, Earth. Normally, these solar particles just pass over the lower latitudes without any special show. But close to the Earth’s poles, these particles interact with the geomagnetic field, creating light shows when the particles from the sun meet particles from the earth. For a more detailed explanation, this breaks it down quite nicely. So, what does all of this science mean for you? Basically, no storms, no show. But generally, the sun is a pretty active guy. You can use this aurora tracker to predict how the aurora will be over the next 3 days. There’s a lot of information on that site, but basically, anything above a kp 5 (rare) will be visible down in southern Sweden, and anything above a kp 2 (more common) will be visible in the Abisko region. Still, it’s all just predictions, and nothing is ever guaranteed with the aurora. Since the aurora can be seen as long as the sky is dark – roughly September to April – pretty much any time within that band will give you opportunities to see Sweden’s Northern lights. Theoretically, the more hours of darkness there are, the higher your chance of seeing the Northern lights is. However, the deeper you are into winter, the higher the chance of winter storms is. And of course, the Northern lights could be doing the most spectacular dance in the world over your head, and you’d never know it if the sky is blanketed in clouds. The truth is that while you have a good chance of seeing the Northern lights in Sweden during this time, you shouldn’t plan your whole trip around it. Instead, I recommend planning your trip based on what activities you want to do outside of seeing the lights. This way, you’ll still have a magical and memorable trip, even if the lights and weather don’t cooperate. Most people want to see the Northern lights as part of a winter-themed trip, combining it with activities such as dog-sledding, visiting with reindeer, snow-shoeing, and ice-trekking. If that’s the case, I recommend visiting in late October/early November or late January/early February. I personally visited around the middle of February and saw the lights 3 times (3 nights in a row! ), but still had sufficient daylight hours to enjoy activities like dog-sledding. Keep in mind that if you visit during the polar night, which runs roughly from December 7 to January 5, you won’t have any daylight hours. While there will be some twilight-like light and not pitch blackness during part of the day, it may be a bit disorienting and some activities may not be as enjoyable. If you want to do hiking, Northern Sweden is an absolutely amazing place for that. The Kungsleden trail is a massive 440 kilometers long and is one of the most famous trails in Sweden. 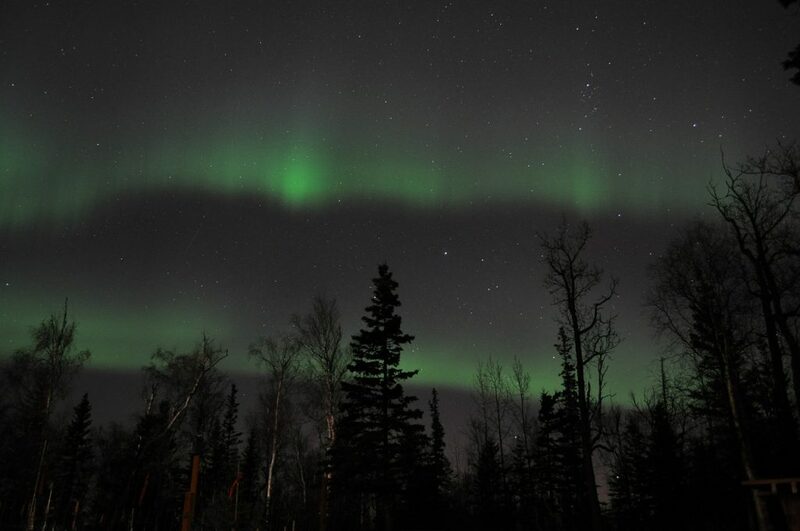 Much of the trail runs through prime Northern lights spotting territory. 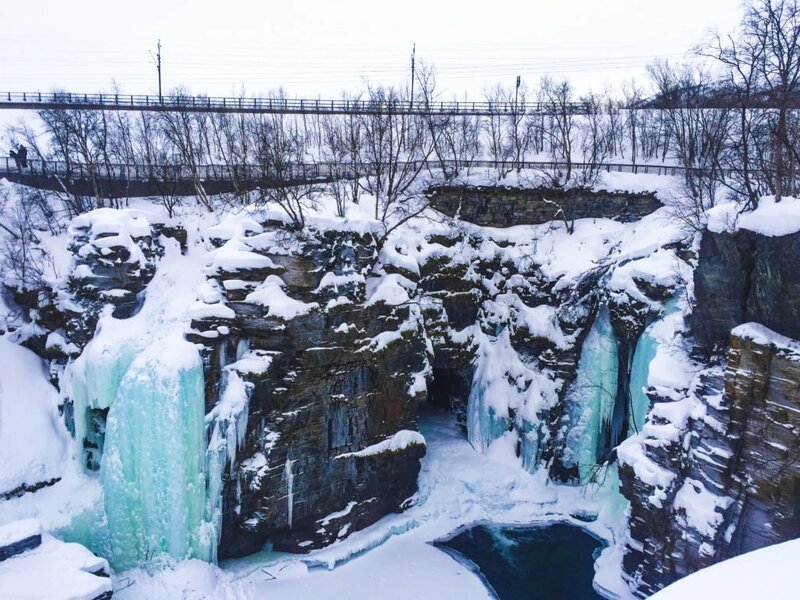 While you certainly don’t have to hike all of it, you could do a small portion of the trek – such as from Abisko to Nikkaluokta, about 100 kilometers – or shorter day hikes on and around the Kungsleden. The Kungsleden trail is open until the end of September, so you can definitely combine some hiking days with Northern lights spotting at night, staying in one of the STF huts along the trail or wild camping if you prefer. 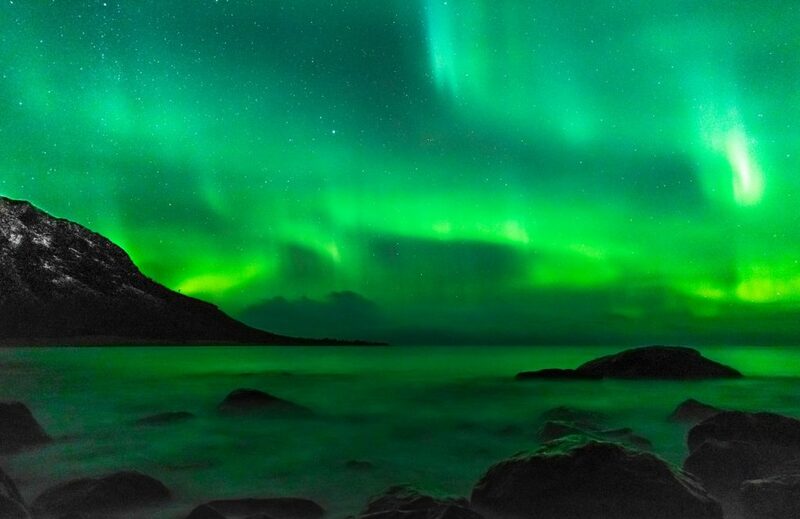 Norway and Iceland are two of the most popular places to go searching for the Northern lights, but Sweden actually has a much better climate for seeing the Northern lights. Basically, anything that shares a coast with the Atlantic is subject to lots of fussy weather. I mean, there’s a reason why the UK and Ireland have notoriously gloomy weather! Iceland’s weather is infamous for being fickle, and the same goes for Norway. Because Sweden is a bit sheltered from the Atlantic by Norway, which acts as a buffer (in my highly scientific understanding), you have more clear nights and therefore a better chance of seeing the Northern lights. Iceland is also not necessarily in the Arctic Circle with the highest amount of solar activity. The higher latitude you are, the more likely you are to see solar activity at night. 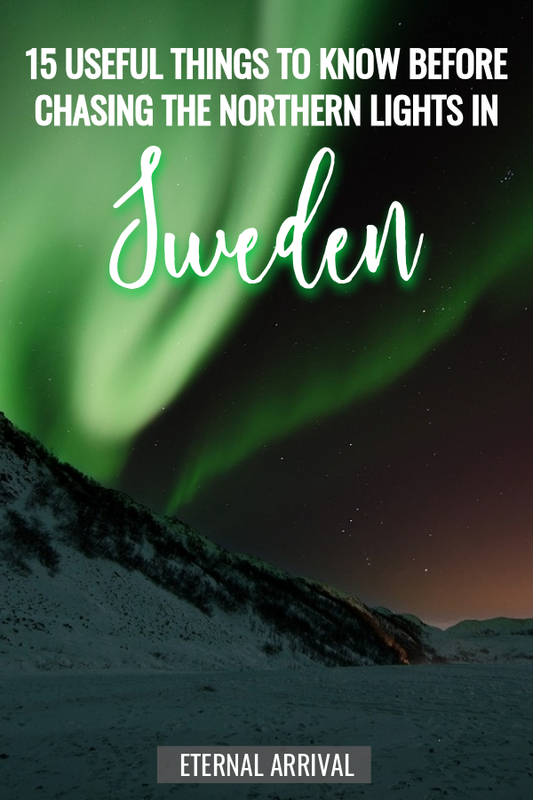 So if the Northern lights are your ultimate goal, I’d definitely opt for Sweden over other countries as a result of the relatively milder weather. 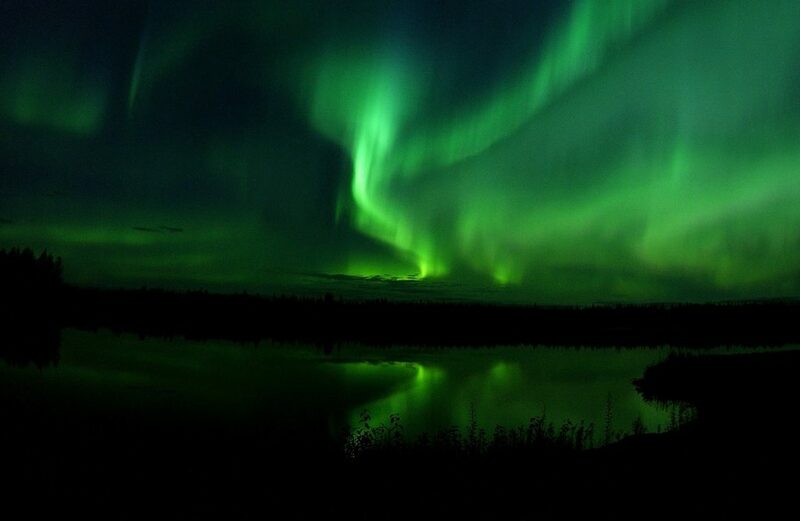 Now, to burst your bubble a bit – the Northern lights are not quite as green as they look in the photos. The photos you’ve seen of Sweden’s northern lights aren’t photoshopped, though: that’s the work of long exposure. Basically, your eyeball is taking in light at, well – the speed of light. Meanwhile, your camera is able to take in light for longer than the split second that light registers in your eye. Most photos you see of the Northern lights were taken over the span of 3 seconds to 30 seconds, meaning that your camera has captured a lot of light detail that your eye necessarily can’t. That said, the Northern lights are definitely not invisible – they look more like a faint green, with occasional brightening pops of brighter neon green. On my final night seeing Sweden’s Northern lights, I was treated to a magical show of greens and purples, bands of light moving rapidly across the sky. The lights were so bright that I was even able to capture them looking bright green with a simple smartphone (which is not typical!). So, don’t go expecting exactly what you see in the photos, but at the same time, don’t worry – should you be lucky enough to spot the Northern lights, you’ll be duly impressed. I mentioned that I got super lucky and was able to snap a photo of the lights with my smartphone one night, but that rarely happens, and still, it didn’t do the lights justice. I had much better luck with my actual camera. I’ve since upgraded my camera gear from my trip to Sweden in 2015, and now I recommend the Sony A6000. It is an excellent entry-level camera that gives professional results. You need a camera which you can change all the settings on: namely, you need to be able to adjust aperture, shutter speed, and ISO. If you are looking for a great travel camera that is affordable, this is my top recommendation. If you are looking for a more advanced camera, the Sony A7R III is the top-rated mirrorless camera in the game, but it costs a fortune, so it’s only worth getting if you are serious about your photography. When I have the money to upgrade my gear, this is without a doubt the camera I am getting. In order to properly capture the Northern lights in Sweden, you will need a tripod. This is because you will need to keep the camera steady for a minimum of 2 seconds or longer in order to get a proper, non-shaky photo. While you may think you can hold still for 2 seconds, trust me – your hands shake naturally (and will do so even more in the snow!) and any photos you take with a long shutter speed will not turn out properly. I recommend buying a sturdy tripod for traveling in Sweden. I have used this cheapo Amazon tripod, but a proper sturdy tripod is a good investment if you are planning on taking your photography seriously. This one by Vanguard is one of the highest-rated in the industry for the price. If you don’t plan on pursuing photography beyond the Northern lights, just buy a cheap tripod, but if you are planning to get more serious about landscape photography I highly recommend making an investment in a sturdier tripod. Another thing to consider is that you will want to use either a self-timer (most cameras come with a 2 second and a 10 second option – 2 seconds should be fine to reduce camera shake) or a remote function to take photos. The Sony A6000/A7R III both have the capability to turn your smartphone into a remote. However, if you already have a DSLR or mirrorless camera that doesn’t have this remote function, you will want to purchase a remote that is compatible with your camera brand, such as this Canon remote or this Nikon remote. One big mistake people make when trying to photograph the Northern lights in Sweden is that they don’t get familiar with their camera and tripod beforehand, especially if they buy new gear. Take the time to read your camera manual and attempt some simple night photos at home before your trip. You will want to use the largest aperture (which, confusingly, is the smallest possible “f” number your lens is capable of). On many cameras, that is somewhere between f.2 and f.4. You’ll then want to play around with your shutter speed and ISO. Basically, you want to use an ISO that allows you to get a 3+ second exposure without degrading the image quality too much. On my Sony A6000, my images get grainy above 1600, but higher quality cameras can be cranked up to 3200 or even higher before getting very noisy and ugly. I’m just an amateur photographer, so this is just what I’ve found from my own experience, but this guide to choosing settings for the Northern lights will likely prove helpful. One thing to considering when trying to photograph the Northern lights is that your camera batteries will drain faster than you ever thought possible – same with your phone if you’re using that as a remote when shooting. To combat this, you’ll want to bring several back-up batteries. I have these cheap Sony A6000 batteries and they work great – the best part is that it charges two batteries at a time. Grab one or two packs for your trip – it’ll come in handy! I found two fully charged batteries were fine for me, but you may want a third or fourth as back-up if you are shooting for a long time or if the weather is especially cold. Finally, a small Anker portable charger will be your phone’s best friend, since your phone battery will drain quickly, too. If you are lucky with the weather and the timing, there is no need for a Northern lights tour – getting a good photo of the aurora is simply a matter of walking out your front door and setting up your gear. 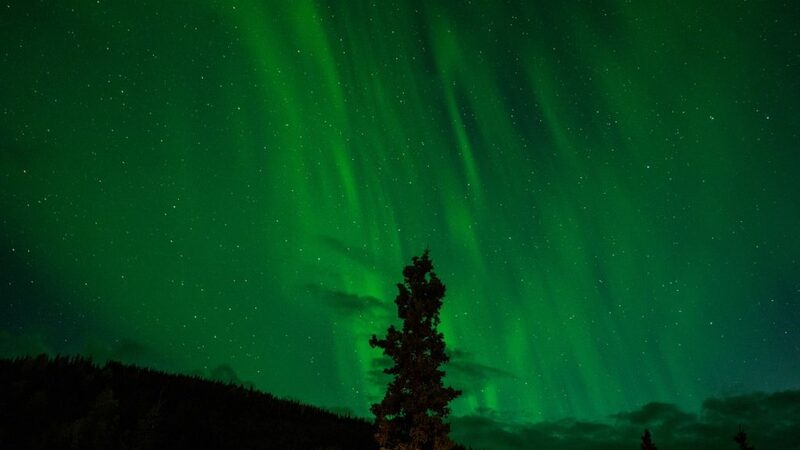 However, if the weather is going to be unpredictable during your stay, or the aurora forecast is on the low side, you may want to opt for a Northern lights tour. These guys are highly skilled at chasing the Northern lights in Sweden and will do everything in their power to try to get you to a place where you can see the lights, although of course, no one can offer a guarantee. Your Northern lights guides will also bring you to beautiful photography locations where you can have an interesting photo composition, so it may be worthwhile if you are really looking to get some killer photos. 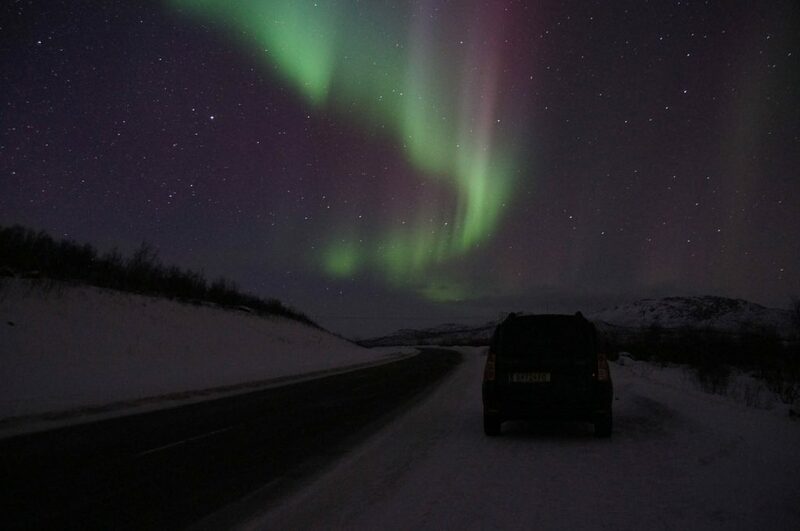 For people traveling on a budget, a Northern lights tour can be quite expensive and actually not really necessary. 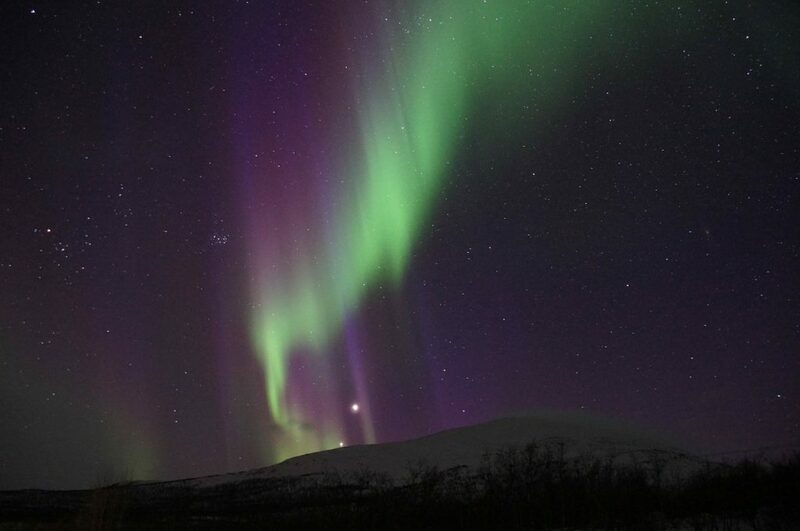 I personally saw the lights 3 nights in a row during my 3 nights in Abisko – but I may have been exceptionally lucky. Still, the first two nights, I only saw tiny glimpses of the lights from behind the clouds, and perhaps had I gone with a tour guide they would have driven us to a less cloudy location and I could have gotten better photos. It’s up to you – I’d base it on a combination of your budget, how badly you want to see the Northern lights in Sweden, and how likely you are to ever return to this part of the world. It is far cheaper to pay for a Northern lights tour than a whole ‘nother trip up North! Similar to what I wrote above about Northern lights tours, the Aurora Sky Station in Abisko is not really worth the money if you are on a budget. For one, while you are elevated above Abisko at 900 meters, that generally doesn’t really make a difference in terms of cloud cover. If it is cloudy at sea level, it is likely to be cloudy at the Sky Station. For another, the Sky Station is just that – a station. If there is bad weather at that spot, you are kind of stuck there, and you don’t have the freedom of jumping in a car and driving around looking for better conditions. They also reserve the right to cancel in case of bad weather and provide a ‘substitute activity’ without giving your money back, so it is a bit of a gamble. Several people have been unlucky with bad weather and not been happy with the replacement activity. However, the Aurora Sky Station does have a really nice dining experience, where you can take a chairlift up to the Sky Station and have a 4-course meal influenced by Nordic cuisine and Swedish ingredients. It is rather expensive, of course, but if you are really aiming for an unforgettable Northern lights trip it’d be a special thing to add to your itinerary. Still – the Aurora Sky Station has an awesome live aurora cam! I stayed at STF Turiststation nearby, and instead, what I did was stay warm and cozy inside the hotel and check the live aurora cam every few minutes for a flash of green or see if the clouds were parting – at which point I’d head out with my camera. I was visiting Sweden on a short weeklong break, and I gave myself 3 days in Abisko National Park in order to try to see the aurora. While I was super lucky and saw a glimpse of it every night, and one truly spectacular light show, I think that 3 nights is the bare minimum you should spend up north if you are trying to see the Northern lights in Sweden. 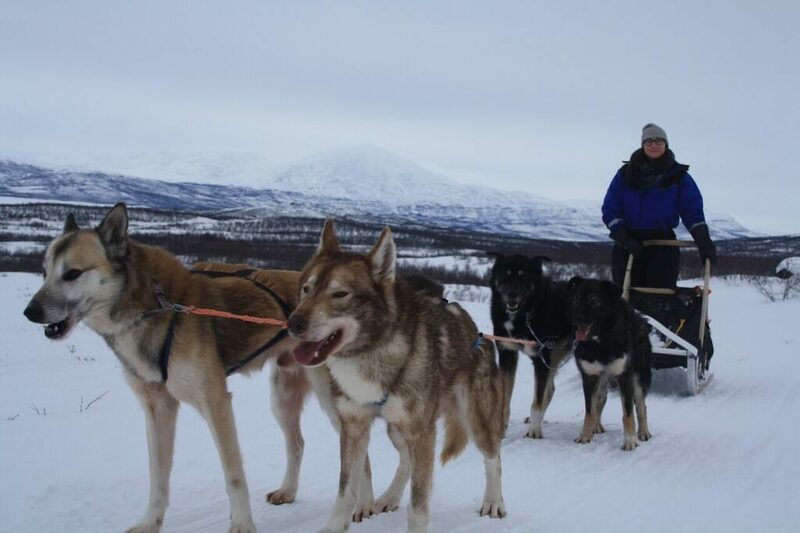 There are tons of activities you can enjoy during the day in Swedish Lapland, from husky sledding (a must-do) to snowshoeing to ice-climbing to snowmobiling to just going through wintry hikes in Abisko National Park. 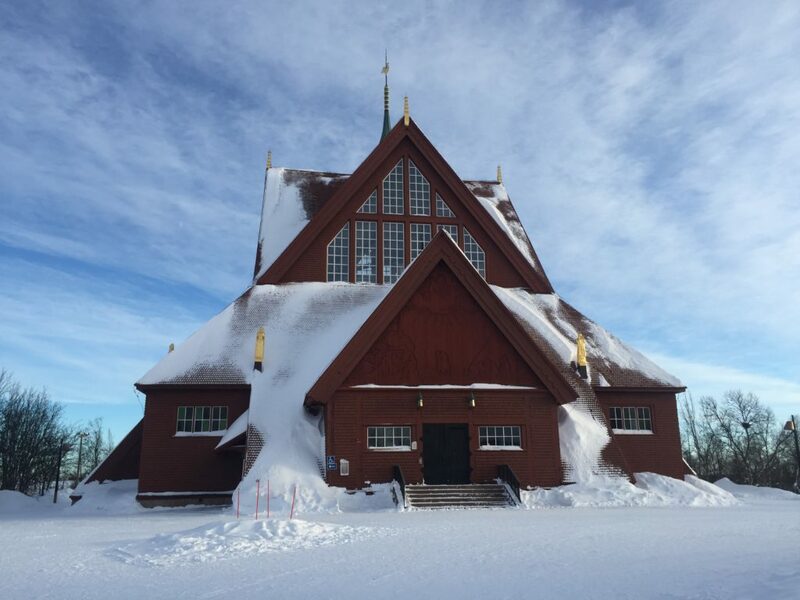 You can also ski at nearby Björkliden or go into town to Kiruna for a day of sightseeing in this surprisingly charming mining town. Many hotels and guesthouses offer free or low-cost snowshoes and cross-country skis during your stay, which is a great way to keep your costs down on a longer stay. Even just sitting in a charming guesthouse with a crackling fire and a cracking book is a good time – so I highly recommend extending your stay to however long is possible, especially since transport is one of the biggest costs and accommodations in Abisko are rather reasonable. The longer you stay, the better your chances of seeing the Northern lights, so if you can stay for 5 days or better yet a week in the North, then all the better. Don’t forget to dress warm! This is yet another “duh” item, but seriously – don’t underestimate the cold! If you are chasing the Northern lights in Sweden, you may be outside for several hours at a time, at temperatures below freezing. A good jacket (I love my North Face parka), thermal layers like these from 32 Degrees, a tight-fitting hat, a warm scarf, and sturdy waterproof gloves are absolute essentials for visiting Arctic Sweden. I’ve actually written a complete packing list for Northern Sweden, which you can find here. 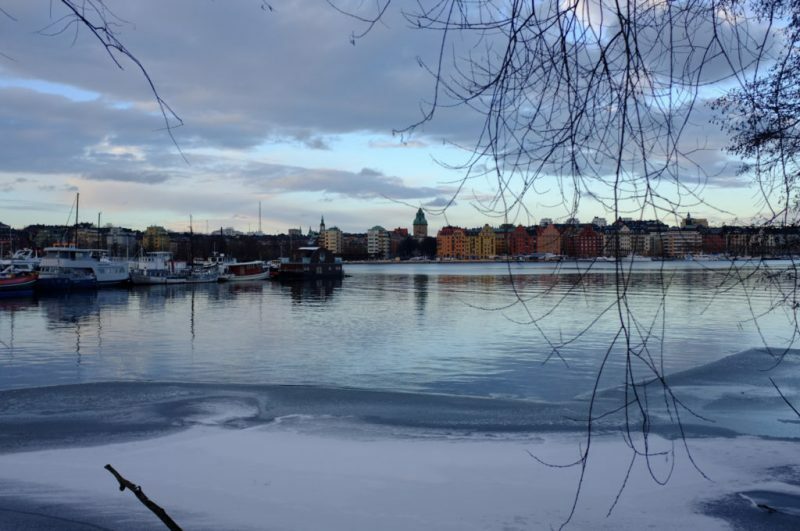 If you don’t have proper winter gear, you will definitely want to buy it beforehand, as consumer goods in Sweden are quite expensive and you will pay a huge premium on clothing you buy in Sweden compared to what you can buy on Amazon back home. 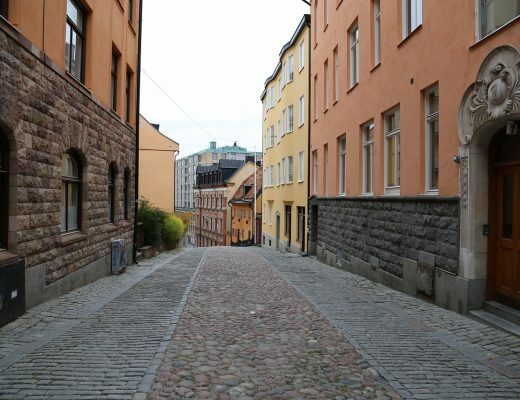 Like I said, don’t expect cheap in Sweden, but at the same time, you can find a variety of accommodation options that are suitable for different budgets. Budget: The best option for where to stay in Abisko if you are traveling on a budget is hands down Abisko Guesthouse. Prices here are extremely reasonable, but the rooms are quite small as a result, and the facilities are more akin to hostel than a hotel. Still, it has nice perks like free use of a traditional Swedish sauna! You won’t be staying in Abisko National Park itself (my preference) but it is a great location nonetheless, easily walkable to town where you can buy groceries and other necessities. It’s especially good if you want to plan a longer, active holiday because the prices are low and they have a lot of activities they can help you book, from snowmobiling to husky-sledding to ice-climbing and beyond. As it’s the most reasonable option by far, it does tend to book up, so click here to check rates, availability, and reviews well in advance of your trip. Mid-Range: This is where I stayed when in Abisko – we were initially planning on staying elsewhere in Abisko, but a last-minute problem at our guesthouse left us getting booked in here. We certainly didn’t complain as it was quite an upgrade! STF Turiststation is located in Abisko National Park a short distance from the shores of the frozen lake. With two amazing, well-stocked kitchens (truly the best of any facility I’ve ever stayed at), tons of areas to lounge around in, extremely reasonably priced breakfast and lunch buffets, and two of their own saunas, STF is in my opinion the best place to stay in Northern Sweden. 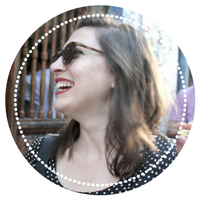 Click her to see rates, availability, photos, and reviews. Luxury: Icehotel in Jukkasjarvi is famous for a reason – this gorgeous hotel is one-of-a-kind. What a lot of people don’t know, though, is that this hotel has both cold rooms made of ice and traditional hotel rooms called ‘warm rooms’ which are much more affordably priced. If you wanted, you could do one night in an ice room to have the crazy, once-in-a-lifetime experience and then spend a few nights in one of the warm rooms. The cold room is -5C — so very cold — but it comes with a sleeping bag with a liner, so that you will be kept warm even as you sleep in a room made of ice. Just note that Jukkasjarvi is far from Abisko, and it doesn’t have quite the same luck that Abisko does in terms of pushing the cloud cover away, but it is located very far from any source of light pollution and you still have an excellent chance of spotting the Northern lights in Jukkasjarvi. The Icehotel understandably is quite popular, so book in advance if you have your heart set on visiting it. Click here to check rates, availability, reviews, and photos! Enjoy this post? Pin it to save for reference!